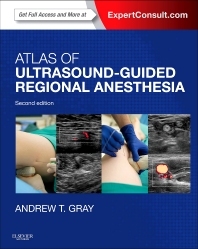 Safely and effectively perform regional nerve blocks with Atlas of Ultrasound-Guided Regional Anesthesia, 2nd Edition. Using a wealth of step-by-step videos and images, Dr. Andrew T. Gray shows you how to use the latest methods to improve the success rate of these techniques. Master essential techniques through step-by-step videos demonstrating paravertebral block, transversus abdominis block, psoas nerve block, subgluteal nerve block, and more. Test your knowledge and prepare for the ABA exam with board-style review questions.